As a long list of companies announce new initiatives to add jobs and enlarge investment in the U.S. economy in the coming age of Trump, Kellogg Co. is announcing that it intends to cut another 250 jobs in America. The famed breakfast cereal company has confirmed recent reports that it intends to scale back its workforce, according to USA Today. Kellogg was still trading on Wednesday near its 52-week low, closing at $71.98, which was five cents below its Tuesday closing. Kellogg has manufacturing plants across the country as well as in 17 other countries. But the company’s profits have been slipping for several years, now, resulting in a cutting of several thousand jobs since 2014. Last November the company announced it was cutting up to seven percent in its international workforce, and that was even after the company cut jobs at its Tennessee Eggo plant in June. 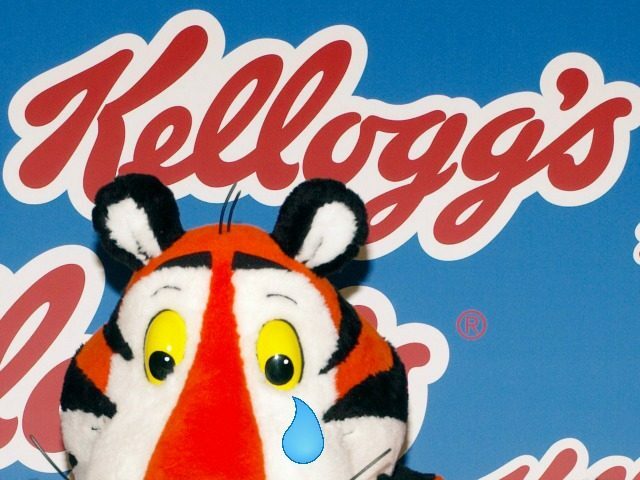 And in 2014 Kellogg closed down a plant in London, Ontario, Canada with a loss of about 500 jobs. The announcement of yet another round of job cuts comes after the company decided to cut its advertising with Breitbart News at the end of 2016, thereby snubbing Breitbart’s 45,000,000 readers. While the decision by Kellogg to cease advertising made virtually no revenue impact on Breitbart.com., it did represent an escalation in the war by leftist companies like Target and Allstate against conservative customers whose values propelled Donald Trump into the White House.